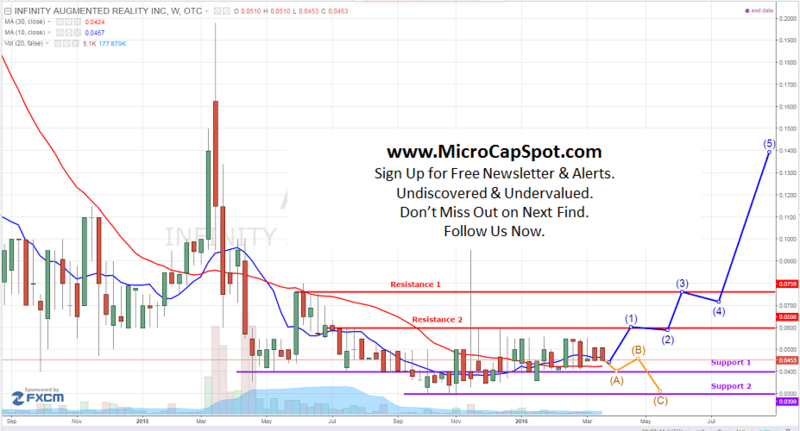 Infinity Augmented Reality Inc (OTCMKTS:ALSO) investors have something to be exciting given the recent developments and the stock gains posted by ALSO. The stock climbed almost 15% and ended the day at $0.052. It advanced on a surge in volume of over 0.5 million shares trading hands which was almost 25 times its average daily volume of only 20,000 shares trading. The volume expansion is very bullish for ALSO which has been relatively thinly traded. InfinityAR has pioneered its solution for Augmented Reality headsets, and is now bringing its Inside-Out Marker-less Orientation and Positional Tracking into the Virtual Reality world. InfinityAR’s Inside-Out Simultaneous Localization and Mapping (SLAM) solution for VR Headsets is based on over the counter RGB stereo cameras and low cost Inertial Measurement Units (IMU). InfinityAR’s engine enables vendors of VR headsets to reduce their cost, reduce motion to photon latency, and reduce power consumption, by way of using the inside-out orientation and positional tracking approach. While you may not have heard of Lumus, they have been providing optical solutions for AR applications in industry and defense for 15 years, so the technology itself is proven. Infinity AR is a newer player, and I think the acceptance of the DK-50 kit will depend in large part on how much performance developers can get out of their software running on the Android-powered Qualcomm Snapdragon in the hardware. From a technical perspective, the stock has been making headway and looking poised to breakout. The volume expansion today was very bullish and it will need to continue the momentum in order for a confirmed breakout. ALSO could triple with the right PR and milestones such as a contract or some exciting news. ALSO is currently trading at a $6 million market valuation. The company has not said much since the beginning of the year and the stock has slowly advanced since then. ALSO needs to provide a shareholder update to excite investors on the development track and partnership with Lumus. We will be updating on ALSO when more details emerge so make sure you are subscribed to Microcapspot so you know what’s going on with ALSO. Disclosure: we hold no position in ALSO either long or short at the publication of this article and we have not been compensated for this article.